Did you know that 43 percent of business trips turn into leisure and business trips (what we call bleisure)? Now consider that 66 percent of bleisure travelers spend more money on leisure activities because of the money they saved on travel. Translation? Bleisurers are ready and willing to spend their money. With that, marketers are in a great position to see their incremental revenue rise by tapping into this segment of travelers. So, to help you reach this audience, we’re explaining how one critical aspect of travel attracts them—destinations. 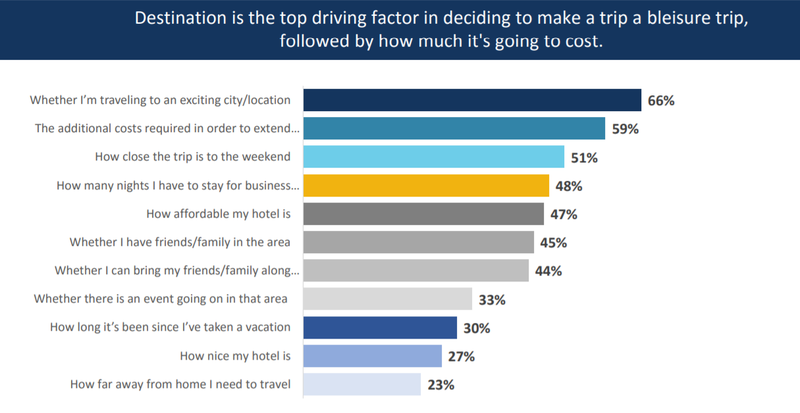 When we asked travelers “what are the biggest factors of a business trip that influence your decision to turn it into a bleisure trip?” the number one response was: “whether I’m traveling to an exciting city/location.” For bleisurers, exciting means your city has numerous activities and experiences. 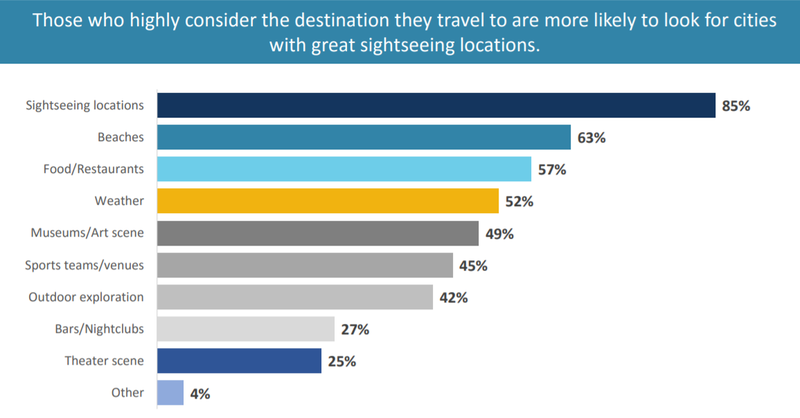 Business travelers are far more likely to add leisure onto their trip if travel brands find ways to highlight unique activities and experiences in their marketing campaigns. 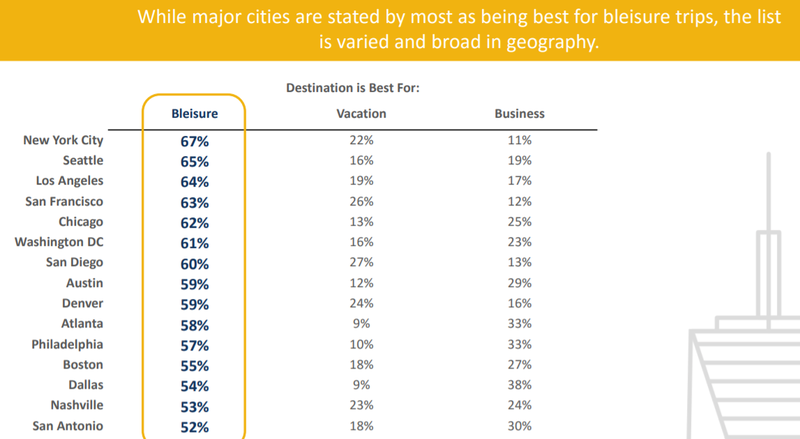 Digging deeper into the impact destinations play in deciding if a business trip becomes a bleisure one, if we look at the top destination cities in the graph below, you’ll notice that they offer a diversity of experiences and a wide range of landscapes and climates. That is to say that any metro destination has the opportunity to become a bleisure one if marketed effectively; ultimately getting money to your destination. Every destination is unique and bleisurers look for this uniqueness in the form of activities. So, reaching this segment means accentuating what sets you apart to encourage business travelers to stay longer. 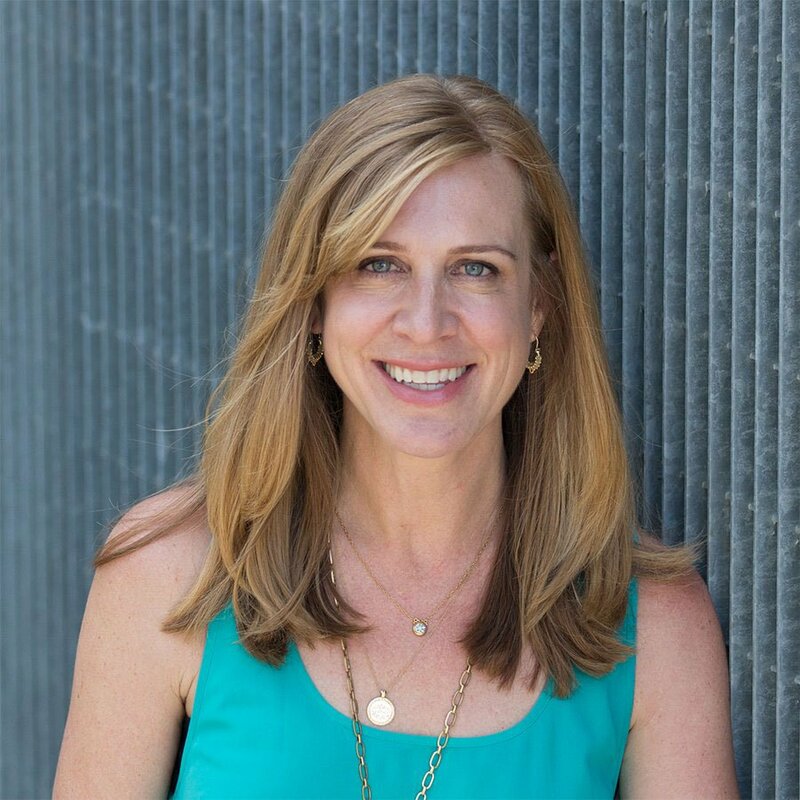 To do this effectively, your marketing content should showcase destination attributes like: sightseeing, great restaurants, museums, sporting events, concerts, etc., because these activities are the most likely to attract bleisurers. While urban areas represent top destinations for bleisure travel, other destinations still have an opportunity to attract these travelers. Based on the graph below, bleisurers seek variety, like relaxing beaches and balmy weather. Still others look for enthralling outdoor exploration or a sophisticated art scene. These attributes are not limited to city size, meaning destinations of all kinds can attract the bleisure traveler. Moreover, don’t underestimate the power of relaxation as a motivating force for this segment of travelers. In our recent travel trends study, one of the main reasons people travel for leisure purposes is to relax. Smaller communities, quiet beach towns, or places with amazing weather offer the perfect opportunity for the business traveler to unwind from their fast-paced business trips. Business travelers turn their trips into bleisure ones for a smorgasbord of reasons—and a main one is the attractiveness of a destination. We’ve shown you what types of destinations attracts them and the types of experiences they seek, all so you can successfully target them. If you’re looking for more insights on this audience, download the .